This article is about the creature. For the quest, see Paarthurnax (quest). Paarthurnax is a meditative dragon residing on the Throat of the World, skywards of High Hrothgar. From here, he serves as the leader of the Greybeards, who are fiercely protective of him. During the Dragon War, Paarthurnax served as lieutenant to Alduin, and they were supposedly close allies. Paarthurnax himself counts Alduin as a brother. During his time as lieutenant, he is said to have committed several atrocities against mankind, despite also being the one who turned the tide in the favor of men. It was Paarthurnax who taught the first Tongues, Gormlaith Golden-Hilt, Hakon One-Eye, and Felldir the Old, to turn the tide in the Dragon War. Despite Paarthurnax claiming he did this after Alduin's false proclamation of Godhood, Nordic legends say Paarthurnax was sent by Kyne to teach man the thu'um. After leaving, and secluding himself atop the Throat of the World, he was able to overcome his draconic instincts by practicing a philosophy invented by Jurgen Windcaller known as the Way of the Voice. After the construction of High Hrothgar, Paarthurnax became the grandmaster of the Greybeards, but remained in seclusion at the peak of the Throat of the World. Paarthurnax also recalls visiting the captured dragon, Numinex, in Dragonsreach around the first era. Even long after the Dragon War, few but the Greybeards trust him, partly because of his race, but mostly because of his past. Especially distrustful of the dragon are the Blades, Delphine and Esbern, who wish him dead. Despite this, Paarthurnax, who thinks of himself as being only what "father Akatosh" made him to be, willingly shares his knowledge with Dovahkiin, and remains hospitable even in the face of death. His name can be separated into three words in the dragon language: Paar Thur Nax, meaning "Ambition Overlord Cruelty". Surprisingly, he only knows the Fire Breath shout. He may greet you with "Drem Yol Lok. Greetings." or "Speak. I will listen." Exiting dialogue will have him say either "Su'um ahrk morah." or "Lok, Thu'um." Alduin's Bane: Exploit the Time-Wound to learn Dragonrend and defeat Alduin at the Throat of the World. The Fallen: Capture and interrogate an ally of Alduin. When the player first arrives at the top of the Throat of the World, Paarthurnax will fly in, land, and initiate conversation. Paarthurnax:"Drem Yol Lok. Greetings, wunduniik. I am Paarthurnax. Who are you? What brings you to my strunmah…my mountain?" Player: "I wasn't expecting you to be a dragon." Paarthurnax: "I am as my father Akatosh made me. As are you… Dovahkiin." Player: "You're the master of the Greybeards?" Paarthurnax: "They see me as master. Wuth. Onik. Old and wise. It is true I am old…"
Player: "I think you already know who I am." Paarthurnax: "Yes. Vahzah. You speak true, Dovahkiin. Forgive me. It has been long since I held tinvaak with a stranger. I gave in to the temptation to prolong our speech." Player: "Why live alone on a mountain if you love conversation?" Paarthurnax: "Evenaar Bahlok. There are many hungers it is better to deny than to feed. Dreh ni nahkip. Discipline against the lesser aids in qahnaar… denial of the greater." Regardless of the response you choose, he will continue: "Tell me. Why do you come here, volaan? Why do you intrude on my meditation?" Player: "I need to learn the Dragonrend Shout. Can you teach me?" Paarthurnax: "Drem. Patience. There are formalities which must be observed, at the first meeting of two of the dov." (After exiting dialogue with player) "By long tradition, the elder speaks first. Hear my Thu'um! Feel it in your bones. Match it, if you are Dovahkiin!" (breathing fire) "Yol…Toor…Shul!" If you hesitate for long, Paarthurnax will urge you on with one of: "The Word calls you. Go to it. ", "I have spoken. The Rotmulaag awaits", or "Why do you intrude here, if not for tinvaak?" After you learn the Word, Paarthurnax will say: "A gift, Dovahkiin. Yol. Understand Fire as the dov do." He will then grant you his understanding of Fire Breath, unlocking the word you just learned. 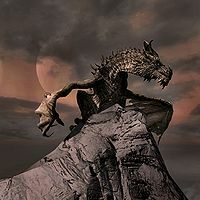 Once the Word has been unlocked, Paarthurnax will urge you to use your new Shout on him by saying: "Do not be afraid. Faasnu. Let me feel the power of your Thu'um. ", followed by one of the following if you hesitate: "Come, Dovahkiin. Nin Yol. Strike me with the fire of your Thu'um. ", "Why do you delay? Are you Dovahkiin or not? ", or "Now, show me what you can do. Greet me not as Argonian/elf/khajiit [sic]/mortal/orc [sic], but as dovah!" After you have used Fire Breath on him, he will say "Aaah… yes! Sossedov los mul. The Dragonblood runs strong in you. It is long since I had the pleasure of speech with one of my own kind." He will then take flight and resettle on the word wall. Once you approach him, he will resume the conversation. Paarthurnax: "So. You have made your way here, to me. No easy task for a joor… mortal. Even for one of Dovah Sos. Dragonblood. What would you ask of me?" Player: "Can you teach me the Dragonrend Shout?" Paarthurnax: "Ah. I have expected you. Prodah. You would not come all this way for tinvaak with an old dovah. No. You seek your weapon against Alduin." Player: "How did you know I came for Dragonrend?" Paarthurnax: "Alduin komeyt tiid. What else would you seek? Alduin and Dovahkiin return together. But I do not know the Thu'um you seek. Krosis. It cannot be known to me." Player: "The Greybeards didn't want me to come at all." Paarthurnax: "Hmm. Yes. They are very protective of me. Bahlaan fahdonne. But I do not know the Thu'um you seek. Krosis. It cannot be known to me." Player: "Do you know Dragonrend or not?" Paarthurnax: "Krosis. Sorrowfully, no. It cannot be known to me." All three options lead to you clarifying with "You don't know it? ", to which he replies "Your kind - joorre - mortals - created it as a weapon against the dov… the dragons. Our hadrimme, our minds cannot even… comprehend its concepts." Player: "How can I learn it, then?" Paarthurnax: "Drem. All in good time. First, I have a question for you. Why do you want to learn this Thu'um?" If you exit the conversation at this point, or at any point before Paarthurnax cuts the conversation short, then when conversation is resumed, he will say: "You have not answered my question: Why do you need to learn this Thu'um?" Player: "That's none of your business." Paarthurnax: "Nid. If you wish me to answer your question, you must answer mine." Player: "I need to stop Alduin." Paarthurnax: "Yes. Alduin… Zeymah. The elder brother. Gifted, grasping and troublesome, as is so often the case with firstborn. But why? Why must you stop Alduin?" Player: "I like this world. I don't want it to end." Paarthurnax: "Pruzah. As good a reason as any. There are many who feel as you do, although not all. Some would say that all things must end, so that the next can come to pass. Perhaps this world is simply the Egg of the next kalpa? Lein vokiin? Would you stop the next world from being born?" Player: "The prophecy says that only the Dragonborn can stop him." Paarthurnax: "True… But qostiid - prophecy - tells what may be, not what should be. Qostiid sahlo aak. Just because you can do a thing, does not always mean you should. Do you have no better reason for acting than destiny? Are you nothing more than a plaything of dez… of fate?" Player: "I didn't come here to debate philosophy with you." Paarthurnax: "Hahaha! You have much to learn of the dov, then. There is nothing else but philosophy to a dovah. It is no accident that we do battle with our Thu'um, our Voices. There is no distinction between debate and combat to a dragon. Tinvaak los grah. For us it is one and the same." Player: "What better reason to act than to fulfill my destiny?" Paarthurnax: "If you can see your destiny clearly, your sight is clearer than mine. Dahmaan - remember, Alduin also follows his destiny, as he sees it. But, I bow before your certainty. In a way, I envy you. The curse of much knowledge is often indecision." Player: "I don't believe in destiny. But I will stop Alduin." Paarthurnax: "And so, perhaps, your destiny will be fulfilled. Who can say? Dez motmahus. Even to the dov, who ride the currents of Time, destiny is elusive. Alduin believes that he will prevail, with good reason. Rok mul. And he is no fool. Ni mey, rinik gut nol. Far from it. He began as the wisest and most far-seeing of us all. " Player: "The next world will have to take care of itself." Paarthurnax: "Paaz. A fair answer. Ro fus… maybe you only balance the forces that work to quicken the end of this world. Even we who ride the currents of Time cannot see past Time's end… Wuldsetiid los tahrodiis. Those who try to hasten the end, may delay it. Those who work to delay the end, may bring it closer." Paarthurnax: "But you have indulged my weakness for speech long enough. Krosis. Now I will answer your question. Do you know why I live here, at the peak of the Monahven – what you name Throat of the World?" Player: "No. Dragons like mountains, right?" Paarthurnax: "True. But few now remember that this was the very spot where Alduin was defeated by the ancient Tongues. Vahrukt unslaad.. perhaps none but me now remember how he was defeated." Player: "I never thought about it." Paarthurnax: "This is the most sacred mountain in Skyrim. Zok revak strunmah. The great mountain of the world. Here the ancient Tongues, the first mortal masters of the voice, Brought Alduin to battle and defeated him." Player: "You said you were going to answer my question." Paarthurnax: "Drem. Patience. I am answering, in my way. This is the most sacred mountain in Skyrim. Most Sacred Mountain. The great mountain of the world. Here the ancient Tongues, the first mortal masters of the voice, Brought Alduin to battle and defeated him." Player: "Using the Dragonrend Shout, right?" Paarthurnax: "Yes and no. Viik nuz ni kron. Alduin was not truly defeated, either. If he was, you would not be here today, seeking to… defeat him. The Nords of those days used the Dragonrend Shout to cripple Alduin. But this was not enough. Ok mulaag unslaad. It was the Kel – the Elder Scroll. They used it to... cast him adrift on the currents of Time." Player: "An Elder Scroll? What's that?" Paarthurnax: "Hmm. How to explain in your tongue? The dov have words for such things that joorre do not. It is… an artifact from outside time. It does not exist, but it has always existed. Rah wahlaan. They are… hmm… fragments of creation. The Kelle… Elder Scrolls, as you name them, they have often been used for prophecy. Yes, your prophecy comes from an Elder Scroll. But this is only a small part of their power. Zofaas suleyk." Player: "Are you saying the ancient Nords sent Alduin forward in time?" Paarthurnax: "Not intentionally. Some hoped he would be gone forever, forever lost. Meyye. I knew better. Tiid bo amativ. Time flows ever onward. One day he would surface. Which is why I have lived here. For thousands of mortal years I have waited. I knew where he would emerge but not when." Player: "How does any of this help me?" Paarthurnax: "Tiid krent. Time was… shattered here because of what the ancient Nords did to Alduin. If you brought that Kel, that Elder Scroll back here… to the Tiid-Ahraan, the Time-Wound… With the Elder Scroll that was used to break Time, you may be able to… cast yourself back. To the other end of the break. You could learn Dragonrend from those who created it." Elder Knowledge begins with the player still in conversation with Paarthurnax. Player: "Do you know where I can find an Elder Scroll?" Paarthurnax: "Krosis. No. I know little of what has passed below in the long years I have lived here. You are likely better informed than I." Paarthurnax: "Trust your instincts, Dovahkiin. Your blood will show you the way." You will then have four topics (not options, you can choose them all, one by one), three of which relate to this quest, and the last of which relates to meditating on Words of Power, covered in the Meditation section. If you exited dialogue when the quest began, the option above will be listed as well, for a total of five possible topics. Player: "What do I do with the Elder Scroll when I find it?" Paarthurnax: "Return it here, to the Tiid-Ahraan. Then… Kelle vomindok. Nothing is certain with such things… But I believe the Scroll's bond with the Tiid-Ahraan will allow you a… a seeing, a vision of the moment of its creation. Then you will feel – know – Dragonrend, in the power of its first expression. You will see them… wuth fadonne… my friends – Hakon, Gormlaith, Felldir." Player: "Hakon, Gormlaith, Felldir? Who are they?" Paarthurnax: "The first mortals that I taught the Thu'um – the first Tongues. The leaders of the rebellion against Alduin. They were mighty, in their day. Even to attempt to defeat Alduin… sahrot hunne. The Nords have had many heroes since, but none greater." Player: "How could an Elder Scroll cast Alduin through time?" Paarthurnax: "Vomindok. I do not know. Perhaps in the very doing they erased the knowing of it from Time itself. The dov are children of Akatosh. Thus we are specially… attuned to the flow of Time. Perhaps also uniquely vulnerable. I warned them against such a rash action. Even I could not foresee its consequences. Nust ni hon. They would not listen." Player: "You mean you were there?" Paarthurnax: "Yes. There were a few of us who rebelled against Alduin's thur… his tyranny. We aided the humans in his overthrow. But they did not trust us. Ni ov. Their inner councils were kept hidden from us. I was far from here on the day of Alduin's downfall. But all dov felt the… sundering of Time itself." Player: "What does the Dragonrend Shout actually do?" Paarthurnax: "I cannot tell you in detail. I never heard it used. Kogaan. It was the first Thu'um created solely by mortals. It was said to force a dragon to experience the concept of Mortality. A truly vonmindoraan… incomprehensible idea to the immortal dov." When you arrive at the Throat of the World, Paarthurnax will be quite impressed with your efforts: "You have it. The Kel - the Elder Scroll. Tiid kreh... qalos. Time shudders at its touch. There is no question. You are doom-driven. Kogaan Akatosh. The very bones of the earth are at your disposal. Go then. Fulfill your destiny. Take the Scroll to the Time-Wound. Do not delay. Alduin will be coming. He cannot miss the signs." After the cutscene from the Merethic Era, once Alduin appears and taunts you, Paarthurnax will say: "Lost funt. You are too late, Alduin! Dovahkiin! Use Dragonrend, if you know it!" At the beginning of the fight with Alduin, Paarthurnax will say: "Unslaad hokoron! Never again!". He will then repeatedly urge you to use Dragonrend; saying: "Dovahkiin, vosaraan! Use Dragonrend before Alduin consumes you! ", "Use Dragonrend, Dovahkiin! ", "He is too strong on the wing! Bring him to gol with Dragonrend! ", "Use Dragonrend! It is the only chance to defeat him!". 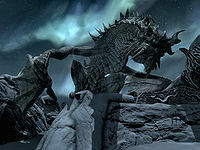 Once you have brought Alduin down with Dragonrend; Paarthunaax will continue to encourage you; saying: "Now, Dovahkiin! Now he is vulnerable! ", "This is your chance, Dovahkiin! Strike with all your force! ", "Hurt him while he is grounded!". During the main quest, Delphine and Esbern will demand you to kill Paarthurnax for the atrocities he committed during the Dragon War. Upon approaching Paarthurnax for this, you can tell him that the Blades say he deserves to die. He will reply, "The Blades are wise not to trust me. Onikaan ni ov. I would not trust another dovah." You can ask why they shouldn't trust him, and Paarthurnax will explain, "Dov wahlaan fah rel. We were made to dominate. The will to power is in our blood. You feel it in yourself, do you not? I can be trusted. I know this. But they do not. Onikaan ni ov dovah. It is always wise to mistrust a dovah. I have overcome my nature only through meditation and long study of the Way of the Voice. No day goes by where I am not tempted to return to my inborn nature. Zin krif horvut se suleyk. What is better - to be born good, or to overcome your evil nature through great effort?" Paarthurnax perches on a word wall. Player: "You're the Master of the Greybeards. Do others come here to train?" Paarthurnax: " I have taught the Way of the Voice for centuries and the Thu'um since long before that. But no, Dovahkiin. Others do not come here to train anymore. Saraan. You are the first in over a hundred years. I meditate on the Rotmulaag - the Words of Power. I counsel in their use. It is enough for me." Player: "You meditate on the Words? How?" Paarthurnax: "Knowing a Word of Power is to take its meaning into yourself. Contemplate the meaning of a Rotmulaag. You will become closer to that Word, as it fills your inner self. Will I teach you, Dovahkiin? What Word calls you to deeper understanding? There are three to master: Fus, Feim, and Yol." The effect applies until you choose another, and does not conflict with the Standing Stones. If you kill Paarthurnax, the bonus will not disappear, but you won't be able to change it. "It is called 'Force' in your tongue. But as you push the world, so does the world push back. Think of the way force may be applied effortlessly. Imagine but a whisper pushing aside all in its path. That is 'Fus.' Let its meaning fill you. Su'um ahrk morah. You will push the world harder than it pushes back." "'Fade' in your tongue. Mortals have greater affinity for this Word than the dov. Everything mortal fades away in time, but the spirit remains. Ponder the meaning of spirit. Unslaad zii. Where mortal flesh may wither and die, the spirit endures. That is 'Feim.' Let that meaning fill you. Su'um ahrk morah. You will find that your spirit will give you more strength." The Fire Within Fire Breath shout deals 25% more damage. "In your tongue, the Word simply means 'Fire.' It is change given form. Power at its most primal. That is the true meaning of 'Yol.' Suleyk. Power. You have it, as do all dov. But power is inert without action and choice. Think of this as the fire builds in your su'um, in your breath. Su'um ahrk morah. What will you burn? What will you spare?" After the first time you speak to Paarthurnax on this subject, instead of the conversation given above, you can simply tell him: "I wish to meditate on a Word of Power." Paarthurnax will then ask, "Which calls to you, Dovahkiin? Fus, Feim, or Yol?" Otherwise his dialogue is the same as the table above. Sissel, a young girl from Rorikstead, will tell you that she had a dream about a "good dragon" who was "old and gray" but "wasn't scary". While it's likely that this was a vision of Paarthurnax, there's no confirmation of this in the game. During the dialogue with him he refers to a time cycle, Kalpa, which is a Sanskrit word sometimes translated as an eon. Paarthurnax is voiced by Charles Martinet. When questioning Paarthurnax about others who have come to train with him, he states that you are the first in over a hundred years. While Ulfric Stormcloak studied with the Greybeards, he left before becoming a Greybeard himself, and Arngeir tells you during The Throat of the World that Paarthurnax rarely meets with them, and never with outsiders. So, Ulfric Stormcloak never studied with Paarthurnax himself. Paarthurnax also appears in the Heroes of Skyrim card expansion for Legends. This page was last modified on 11 March 2019, at 19:57.